Now we take it directly to your home or business. Without intermediaries. We are farmers, and we grow our tomatoes as our grandparents did. "As farmers, we have to understand and realize the great responsibility that comes cultivate and provide food to consume thousands. And not everything, our products have to be healthy, and environmentally friendly." In our culture we do NOT use grafts from other varieties. They produce a larger fruit growth, but considerable loss of their properties. In pepeRaf NO use hormones, or other chemical agent for growth or flavor enhancer. Our tomatoes taste like tomatoes Raf really. If you are a regular at our shop, your loyalty orders joining our club friends, and get the best prices and benefits. Always order a month with the maximum discount. You will not have to order. We take care of everything. And if you need more, we respect your discount. And at the end of the harvest, we give you a box of tomato Raf. A unique product, we maintain more than 40 years ago using traditional farming techniques, to obtain the highest quality. 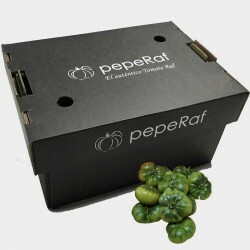 pepeRaf is a young and dynamic family business, based on the experience of three generations committed to the continuity of one of the most exquisite and natural market Raf tomato products.